What's fun about a road trip is that anything can happen. You set out with your friends hoping to see new sights, have some great moments, and revel in the journey and not necessarily the destination. If The Crew's vision of America is a giant map with the tantalizing open road stretching out before you and limitless possibilities with your friends, then it also ignores the downside of a road trip. Sure, anything can happen – but that doesn't mean it will. Tedium and the question "Are we there yet?" 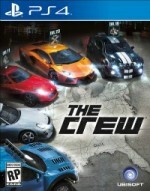 are just as much the hallmarks of the Crew as its open world. The game's story involves avenging the death of your brother (more on that later), but you're free to explore the entire map of America at any time. The central caveat to this is that the world itself doesn't offer a lot of compelling content. You can roam around looking for hidden parts for a car you can build, but even with an online crew member by your side you cannot tackle the game's many skills challenges cooperatively, interact with them in the world, nor get up to the kind of mischief that rewards your exploits or encourages impassioned exploration. In fact, the skills challenges are level gated, so if you trek out to the west coast early in the game, for example, you won't be able to do anything but sightsee some of the game's designated landmark points for XP before you fast travel back to where the action is. Thankfully, the game's loop of earning car parts, leveling up (both yourself and your cars), and buying different car kits (specializing your car for dirt, street races, etc.) is satisfying and well balanced. You're constantly rewarded for completing skills challenges, story missions, PvP races, and other tests. Furthermore, the interoperability of the parts means nothing is wasted; duplicate parts can be banked for use in future cars or sold (albeit for a pittance). I liked seeking out challenges with powerful parts, but also didn't feel I had to grind too much to get my cars up to snuff. Given that there isn't an exceptional impetus to roam around in the open world with your crew of up to four racers, I used them more for help in the escape and takedown story missions (where you all work together to damage out an enemy) and PvP – but it's easy to get smoked in this mode by much higher-level cars. Getting in and out of a crew is easy to do either with various friends or those random players in your immediate vicinity, but its convenient nature only underscores how little weight your crew has. You don't name it, give it a logo or livery, or assign any personality to it. You can join a faction, which serves as a meta-umbrella for your activities, earning more cash and XP, but it's not a motivating feature. Counterintuitively, for a game whose ostensible allure is online co-op and the ability to explore an open world, the Crew's story (along with its car parts) might be more of a draw than you think. Despite its cliched story, following the main path does provide some motivation. It features a mix of events that include some scripted chases and moments, and the voice actors give it their best to try and make the game more than a big map. As far as road trips go, The Crew is about as average as they come. There are some fun times, but you may be surprised to discover that America is a pretty empty place. This review pertains to the PlayStation 4 version of The Crew. The game is also available on Xbox One, Xbox 360, and PC. Ubisoft's road trip gives you freedom to explore, but not the best reasons to do so.